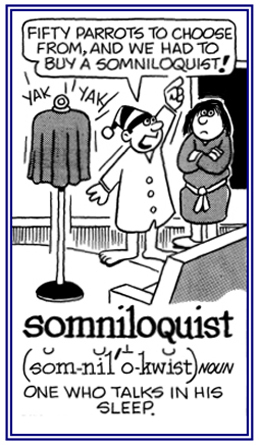 Speaking in soliloquy or to oneself. Someone who produces a dramatic or literary form of discourse in which he/she talks to himself or herself, or who reveals his or her thoughts without addressing a listener or anyone else. 1. To talk to or to converse with oneself, or to utter one’s thoughts aloud without addressing anyone. 2. Performing a literary production representing, or imitating, a discourse. 3. The act of speaking to oneself; soliloquizing. 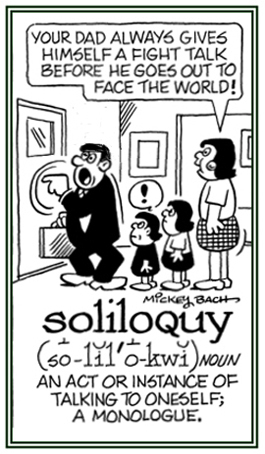 Speaking a soliloquy, or speaking to oneself, during the course of a play. 1. 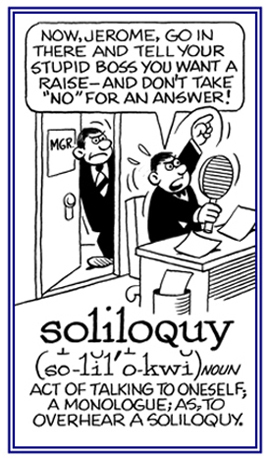 The act of speaking while alone; especially, when used as a theatrical device that allows a character's thoughts and ideas to be conveyed to the audience: Soliloquies and monologues have one thing in common: they each involve a solitary speaker in a dramatic presentation. A monologue, from the Greek monos, "single" and legein. "to speak" is a speech given by a single person to an audience. Marc Antony delivered a well-known soliloquy to the people of Rome in Shakespeare's "Julius Caesar" drama. The noble Brutus Hath told you Caesar was ambitious. 2. 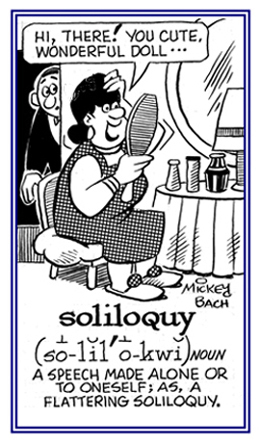 Etymology: from Latin solus, "only to oneself" + loquor, "talk, speak". © ALL rights are reserved. Relating to talking while asleep. Talking or muttering when someone is asleep: Hayden often has somniloquences which upset his wife; however, he has no control over them. The act or habit of talking while sleeping. 1. 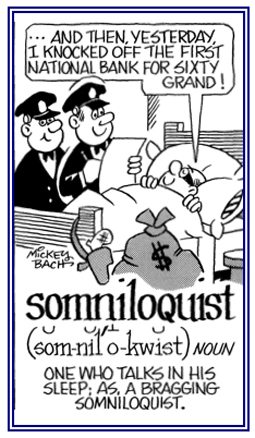 Someone who talks when in bed during the night: Kitty amused her sisters while she was sleeping because she was a somniloquist and often said the silliest things. 2. 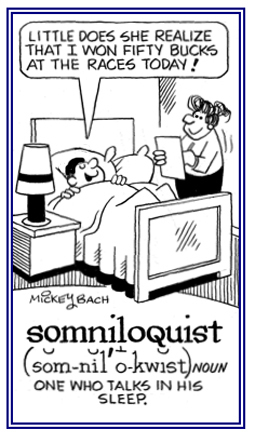 Etymology: from Latin somni-, "sleep" + -loquy, loqui "to speak, to talk." © ALL rights are reserved. 2. Talking that takes place while under the influences of hypnotic suggestions. Characterized by silly talk; babbling. 1. An urbane, sophisticated manner of speaking. 2. Speaking in a smooth way. Showing page 7 out of 8 pages of 119 main-word entries or main-word-entry groups.